On April 10, 2019, Pennsylvania Youth Congress (PYC) launched Pennsylvania Values as its new campaign to secure statewide LGBTQ nondiscrimination protections! Please visit the Pennsylvania Values website to learn more on this issue. For the first time in nearly a decade, we have a promising path forward to advance LGBTQ nondiscrimination legislation in Harrisburg. Contact Your Legislator. You can use PYC's action tool here on the Pennsylvania Values website to send your legislator a message directly. Ask all businesses you know to sign onto the Pennsylvania Values Business Pledge here. Over a 1,000 businesses signed onto a supporter statement several years ago, and PYC wants to far surpass that number. Ask all faith leaders you know to sign the Pennsylvania Values Faith Leader Open Letter here. PYC invites pastors, imams, rabbis, and all leaders of faith-based institutions to share their support. Ask key local and county elected officials you know to support LGBTQ nondiscrimination protections here. PYC would like stories from LGBTQ Pennsylvanians about why this law is important. PYC invites folks to share written reflections of their experiences with discrimination, or a positive message of why nondiscrimination protections have been helpful (if in one of the 55 municipalities that currently has a local ordinance). Pennsylvania Values has been created by the Pennsylvania Youth Congress, and is in partnership with the ACLU of Pennsylvania. PYC was founded in 2011 as our first and only statewide LGBTQ youth organization, and is headquartered directly across the street from the state Capitol in Harrisburg. As many of you may remember, the last organized effort for this legislation came together in 2015-2016 but was unsuccessful. PYC was not part of that work, as we generally focus on LGBTQ-youth specific legislation. With this opportunity, PYC has come forward to lead and bring together our nearly 10 years of relationships and expertise in Harrisburg so that we press ahead with our strongest plan possible. Why Now is Different: In January, the former chairperson of the House State Government Committee, who had refused to bring the bill for a vote, was reassigned to lead another committee. An ally of our ours has the bill currently in her committee in the state Senate. PYC has been working around the clock these past few months to set up an advocacy path in the General Assembly, and design and build the Pennsylvania Values campaign. It's an exciting time, but we have months of heavy lifting to move forward. PYC's approach is vastly different than the 2015-2016 effort. PYC is focusing on local messengers and small town Pennsylvania. It is no longer referring to this legislation as the "Fairness Act" but rather simply LGBT nondiscrimination protections, and when the final bill emerges, the "Pennsylvania Values Act." While it's still an uphill climb, PYC is cautiously optimistic about advancing this legislation. For now, it's all hands on deck. 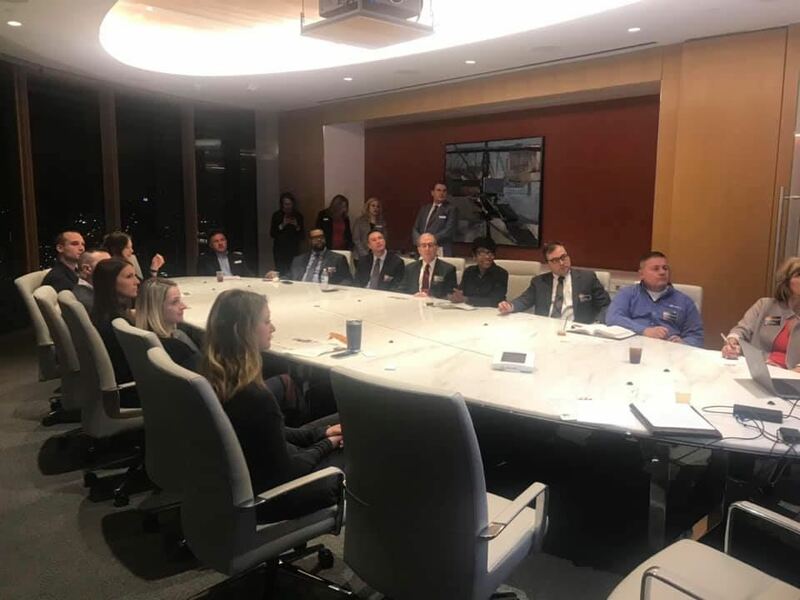 Last week, PYC convened a meeting in Philadelphia with the ACLU, Freedom for All Americans, the National Center for Transgender Equality, and HRC to brief them and begin discussions on future collaboration. However, it is only through you as local and regional leaders that we will be successful in our state. If you would like to support PYC's work in this effort, 3RBA invites you to donate to Pennsylvania Youth Congress Foundation here (a 501(c)(3) organization) and the Pennsylvania Youth Congress here (non-tax-deductible donation for our political work). Congratulations To Our Latest Certified LGBT Businesses! 3RBA congratulates Setting Entertainment LLC and Missie Berteotti for recently becoming certified by the National LGBT Chamber of Commerce (NGLCC) as LGBT Business Enterprises® (LGBTBEs®). Setting Entertainment is owned by Brad Setting and provides event planning, entertainment consulting, and event marketing services. Missie Berteotti is LPGA Golf Professional who helps women and other clients get their financial life in balance. Both Setting Entertainment and Missie Berteotti became certified as LGBTBEs® through 3RBA’s Let's Get Business Together! program. Funded in part by the NGLCC and Wells Fargo, 3RBA’s Let's Get Business Together! program seeks to expand the number of certified LGBTBE® in the Pittsburgh/Greater Allegheny region. To learn more about the LGBTBE® certification process, visit our Get Certified page. Also, check out our Events page for all Let's Get Business Together! events. Three Rivers Business Alliance (3RBA) is proud to announce TierPM LLC has joined as a corporate partner. Headquartered in Pittsburgh, TierPM is an NGLCC-certified audio visual and IT workforce solutions company offering recruiting, staffing, application development and project management solutions for clients nationwide. 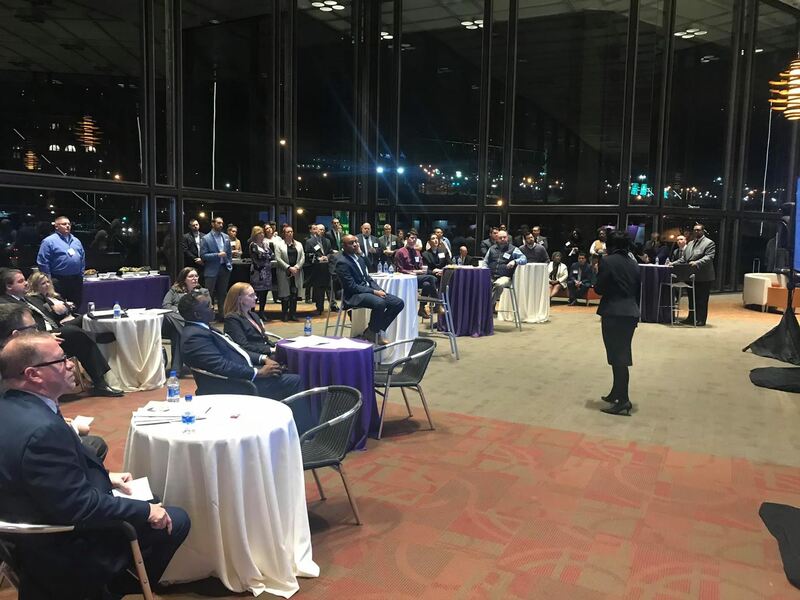 Launched in early 2018, 3RBA serves to promote networking and business development within the LGBT+ and allied business community operating in the Pittsburgh and Greater Allegheny region. As a registered IRC 501(c)(6) organization, 3RBA is committed to expanding the economic interests of LGBT+ owned and allied businesses through advocacy, education, business development and growth, diversity, leadership, and partnerships throughout its region. 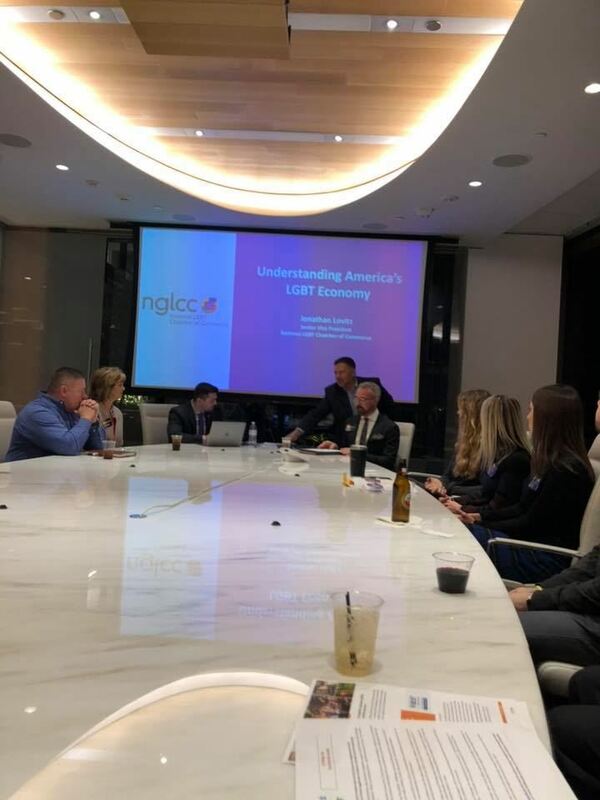 Also, as an NGLCC affiliated chamber, 3RBA serves as a point of connection for LGBT+ and allied business owners and professionals, corporations, nonprofits, and civic leaders. Learn more about 3RBA at www.3rba.com. Harrisburg, PA – The Pennsylvania Department of General Services Bureau of Diversity, Inclusion and Small Business Opportunities (BDISBO) is accepting applications for businesses interested in participating in the statewide Mentor-Protégé Program (MPP). The application period runs through February 22, 2019. The objective of the MPP is to pair prime contractors and/or suppliers with DGS-verified Small Diverse Businesses (SDBs) to provide developmental assistance and help them successfully solicit and perform on commonwealth supplies and services procurement contracts and non-highway capital construction projects. Small Diverse Businesses are those owned by minorities, women, LGBT, veterans and people with disabilities. Businesses interested in serving as mentors and/or protégés are being sought. Firms interested in participating in the MPP must submit an MPP Application/Agreement. Applicants may submit in pairs or individually. Non-paired MPP Agreements will be reviewed for matching by the BDISBO office based on availability. Once paired, the mentor and protégé enter into an official agreement for a one-year period that defines the relationship and any developmental goals identified by the participants. Program slots are limited, so businesses are encouraged to apply as soon as possible. For more information or to fill out the application visit the DISBO Mentor-Protégé Program Application page online. BDISBO implements programs to increase contracting opportunities for small and small diverse businesses. BDISBO also provides training, technical assistance, and support for small and small diverse business owners to help them compete for prime and sub-contracting opportunities with the goal of promoting the economic growth and success of these businesses. In addition, the bureau is also responsible for ensuring that contractual commitments are maintained, during the contract term, through compliance monitoring activities. At its annual meeting on December 11, 2018, Three Rivers Business Alliance (3RBA) elected three directors for a three year term, starting January 1, 2019. The elected directors are: David W. Bubas; Bryan Jeffers; and Cameil D. Williams. David W. Bubas is the Director of Diversity Strategy Execution and Workplace Inclusion at UPMC. 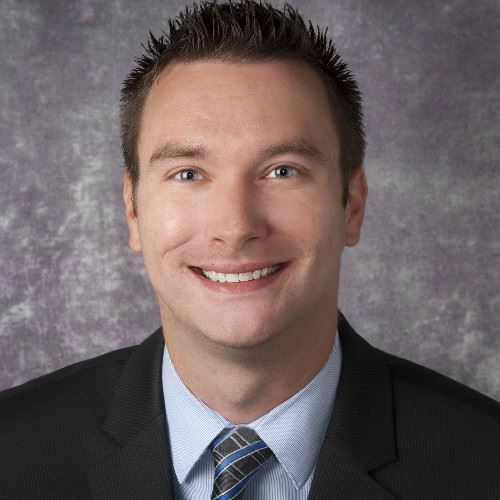 David began his career at UPMC in 2005 and currently is responsible for providing guidance and strategic support for diversity and inclusion practices, policies, and return on organizational mission efforts for UPMC. David received a B.S.in Business Administration from Duquesne University and a M.B.A. with a concentration on Human Resources from Waynesburg University. 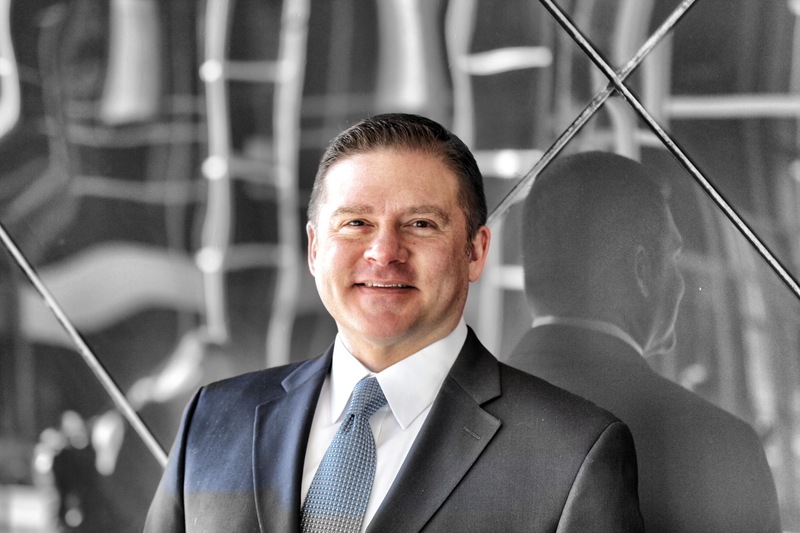 Bryan Jeffers is a Vice President and Lead Product Manager at PNC. Joining PNC in 2012, Bryan is responsible for PNC’s Healthcare Revenue Cycle Automation client implementation delivering workflow management, reporting, and data analytics to healthcare providers. Bryan also leads the Pittsburgh branch of PNC’s LGBT Employee Business Resource Group, PNC Proud. Bryan received a B.S.in Economics and a M.B.A. in International Business and Finance from Duquesne University. 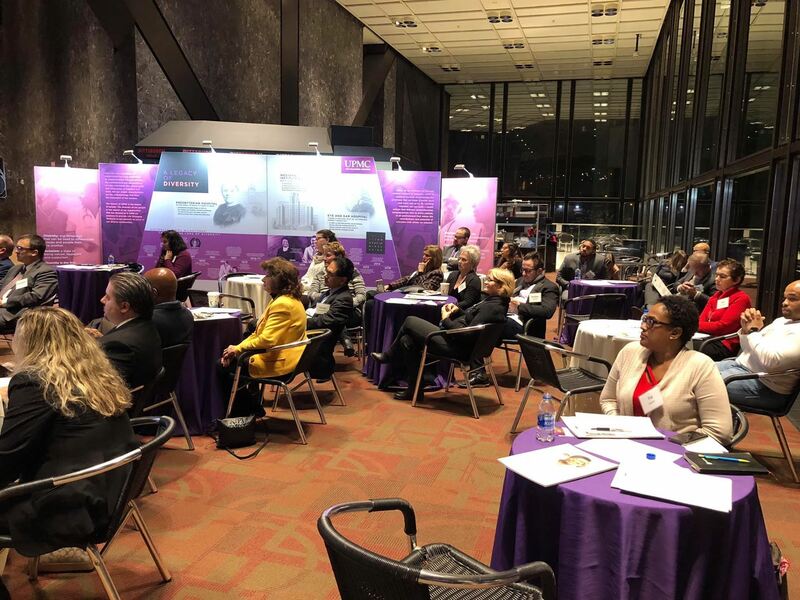 Cameil D. Williams is a Manager of Small Diverse Business at UPMC with extensive expertise in contract administration, compliance, and diversity consulting services. 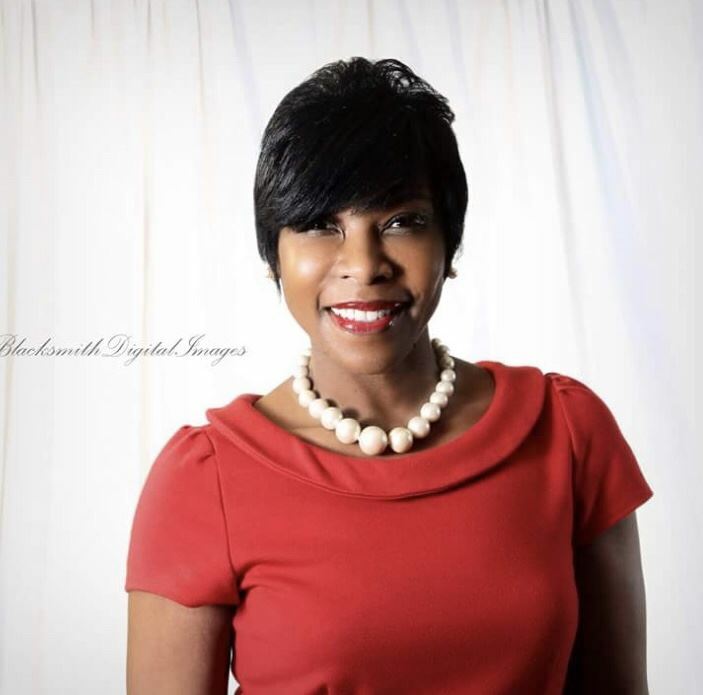 She formerly served as director of the Allegheny County Department of Minority Women and Disadvantaged Business Enterprise and as a program manager for the Port Authority’s federal and state contract compliance programs. Cameil received a B.S. in Criminal Justice Administration from Lincoln University and Master Level Certification in Human Resources from Villanova University. David, Bryan and Cameil join 3RBA’s eight other directors. 3RBA thanks David, Bryan, Cameil and all of its directors and officers for lending their time and expertise to 3RBA as it grows over the next three years. 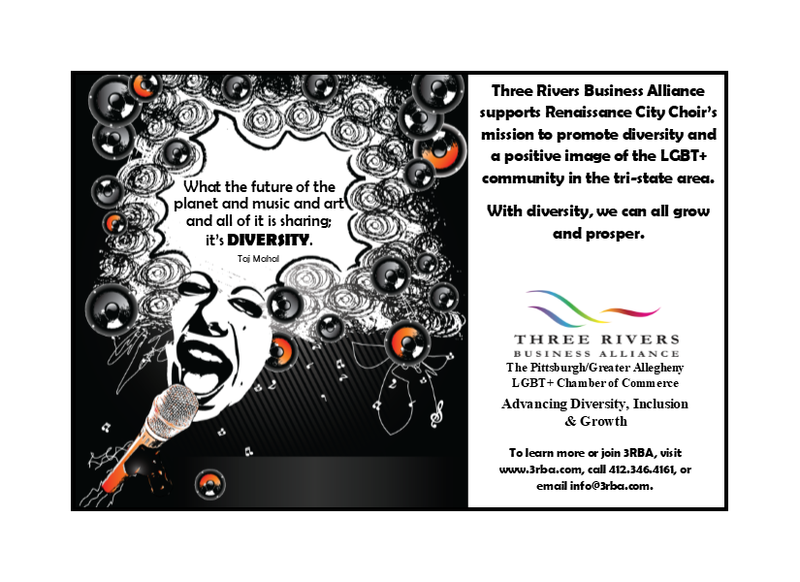 Launched in early 2018, Three Rivers Business Alliance promotes networking and business development within the LGBT+ and allied business community operating in the Pittsburgh and Greater Allegheny region. As a registered IRC 501(c)(6) organization, 3RBA is committed to expanding the economic interests of LGBT+ owned and allied businesses through advocacy, education, business development and growth, diversity, leadership, and partnerships throughout its region. 3RBA is the region’s only affiliate chamber of the National LGBT Chamber of Commerce (NGLCC) which verifies and grants LGBT Business Enterprise® (LGBTBE®) designations to qualified businesses as part of its LGBT Supplier Diversity Initiative. 3RBA membership is open to all LGBT+ and allied business owners and professionals, nonprofits, corporations and civic leaders. Learn more about 3RBA at www.3rba.com. Three Rivers Business Alliance proudly announces its support of the Renaissance City Choir as it kicked off its 2018-2019 concert season. Renaissance City Choir affirms and celebrates LGBTQIA+ identity through the unifying power of music. To learn more about the Renaissance City Choir and its concert schedule, visit www.rccpittsburgh.com/. We are profoundly saddened by the horrific attack on members of the Jewish community gathered for worship at the Tree of Life Synagogue on Saturday, October 27, 2018. The attack represents a purely evil act which has no place in our society. To the entire Jewish community of Pittsburgh, and all of our Jewish friends and members, Three Rivers Business Alliance stands with you in solidarity against this hatred, and we join our fellow Pittsburghers in mourning those murdered and injured through this senseless act. As an organization dedicated to making the Pittsburgh/Greater Allegheny region an influential and diverse business community, 3RBA strives to build a society in which all persons live and work in harmony. We will continue to build a bridge of tolerance, understanding, and love for all, and we will work to bring equality and opportunity to all regardless of their age, race, gender, sexual identity, religion, political association, ethnic origin, or any other individual or group characteristic unrelated to ability, performance, and qualification. The Jewish Federation of Greater Pittsburgh has established a fund to help those affected by the attack. Please consider standing in solidarity with our Jewish Community by making a contribution. Every bit helps. 3RBA receives GuideStar's 2018 Bronze Seal! Three Rivers Business Alliance was recently recognized for our transparency with a 2018 Bronze Seal on our GuideStar Nonprofit Profile! In order to get the 2018 Bronze Seal, 3RBA shared important information with the public using our profile on www.guidestar.org. Now, our community members and potential donors can find out more about our mission and programs. Check out 3RBA's GuideStar Nonprofit Profile and tell us what you think.